Patch Notes for the Legion Pre-Expansion Patch is now available. World of Warcraft: Legion is live! The time has come to embark on your quest to the Broken Isles, to seek out and master Artifact weapons of legendary might, and to rally like-minded champions to your cause in your Class Hall. In this desperate hour, you must also strike a forbidden pact with the outcast Demon Hunters of the Illidari, fel-twisted disciples of the dreaded Illidan the Betrayer. Should you fail . . . worlds will burn. Maximum level increased to 110. New PvP Prestige and Honor Talents system. Unlock new appearances by collecting Soulbound weapons and armor of your character's primary armor type. Unlocked appearances are account-wide and usable for transmogrification by other characters that can equip the item. When first logging into a character after Patch 7.0, the appearances of appropriate items in your bags, bank, and Void Storage are learned automatically. Additional appearances will be unlocked based on previously-completed quests. Transmogrifiers located in most major cities have been improved with additional features. Got a look that you like? Save the entire transmogrification set as an outfit. Create and swap between outfits at the Transmogrifier. Additionally, transmogrifications can now be associated with your current specialization. Your outfit automatically changes when switching specializations if you so desire. Added a new option to hide shoulders. The option to hide helmets, cloaks, and shoulders has been moved into the transmogrification system. The PvP Reward System will now provide appropriate items for players level 100 and below. Honor Points and Conquest Points have been removed as a currency. Items that were purchased using Honor or Conquest are now available for purchase with Marks of Honor that can be earned from Battlegrounds, Arenas, and Skirmishes. Learn more about upcoming PvP changes in our Legion PvP Preview. Gear has been normalized in PvP combat. Characters entering a Skirmish Arena, Battleground, Rated Arena, Rated Battleground, or Ashran now receive an aura called Principles of War. Principles of War removes all stats gained from gear (Strength, Stamina, Haste, etc. ), disables gear related bonuses (like trinket effects and set bonuses), and gives the character stats based on their specializations, and increases based on overall item level. The goal is to provide a much more finely tuned and balanced PvP experience. The pennant attached to the back of characters now changes its appearance based on the playerâ€™s best rating in the Arena bracket. The 5v5 Arena bracket has been retired. "Arena Master" achievement has been converted into a Feat of Strength. Queueing for a random Battleground and winning with a character below level 110 now awards a Crate of Battlefield Goods. Players on the opposing team also have a chance to receive a crate with an increasing chance based on team score at the end of a match. The crate contains a piece of armor appropriate for the characterâ€™s level and specialization with a chance for the crate to contain additional rewards such as weapons or relics. Enemies on Normal, Heroic, and Mythic difficulty now deal roughly 30% less damage. Normalized gold from Legacy raids prior to Warlords of Draenor. Heroic difficulty Cataclysm Raids now award less gold than before, while raids from Mists of Pandaria and Wrath of the Lich King will now award more gold. Ruins of Ahnâ€™Qiraj now resets daily instead of every 3 days. Need/Greed and Round Robin looting options have been merged into the Group Loot setting. When Group Loot is chosen, main-specialization Need takes priority over off-specialization Need, followed by Greed/Disenchant. Master Loot has been renamed â€œGuild Master Lootâ€ and is only selectable in guild groups. A guild group is defined as one where at least 80% or more of the group belongs to the same guild. If a group meets that requirement, the group leader may select Guild Master Loot regardless of their own guild affiliation. Personal Loot now allows players to trade any items that are not Item Level upgrades for them to eligible groupmates, subject to the two-hour trade timer. In outdoor world content, loot will be distributed using the Personal Loot method, regardless of which option the group leader has selected. Players can no longer start the quest line for the legendary ring. Players currently on the legendary quest line have until the launch of Legion to complete it; at which point uncompleted quests will be removed from the quest log. All creatures and NPCs can now be tapped by up to 5 other characters. The Brawler's Guild is taking a break and will return at a later date. The Stranglethorn Fishing Extravaganza has taken a temporary hiatus while the fish are restocked. In an effort to reduce the amount of gear swapping between specializations, the following changes have been made. Legion cloaks, rings, and items worn on the neck are no longer tied to a specific primary stat, and will remain relevant between specializations. Spirit and Bonus Armor have been removed. Multistrike has been removed. Items that had multistrike have had it replaced with another secondary stat. Trinkets obtained from Raids, PvP, and world drops in Warlords were overtuned and have been brought back to intended power levels. Set bonuses for item sets from expansions prior to Warlords of Draenor have been deactivated, though the text describing their former function still remains. Spell Power on all caster weapons have been consolidated into Intellect to make it easier to compare item power between two caster weapons. Overall weapon power remains unchanged. Potion of Luck and Greater Potion of Luck no longer have an effect. Gladiator's Distinction set bonus has been removed from all PvP trinkets. Characters can now change between any of their specializations while out of combat. Action bar configurations and talent loadouts are saved for each specialization. As a result, Dual Specialization has been removed. Updated and improved on the animations, visual effects, and audio on core combat interactions like auto-attacks as well as many melee class abilities. Players may now change talents freely when in any rested XP area. The Inscription profession can craft consumable items that allow for this to be done in the field. In addition, after queuing into an instanced dungeon, raid, or PvP content, players have a grace period during which they may change talents freely. The Glyph panel has been removed from the game. Some minor glyphs that had a cosmetic effect that does not apply to a specific spell have been converted into cosmetic items that provide the same effects as before. Some minor glyphs that made cosmetic alterations to a specific spell have been added to the spell itself in the spellbook. Draenor Perks have been removed from the game. 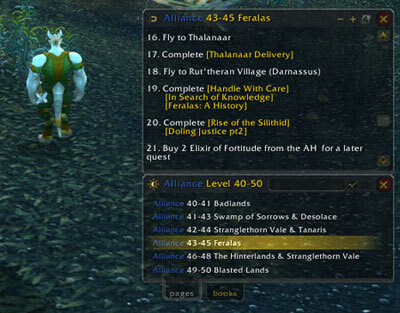 Hunters and Shaman can now equip Mail armor from level 1 (down from level 40). Warriors and Paladins can now equip Plate armor from level 1 (down from level 40). New Mail and Plate reward options have been added to low level quests. Every Man for Himself now removes all Stun effects and shares a 30-second cooldown with other items or abilities that have a similar effect. All classes and specializations have undergone changes to abilities and mechanics. Check out our class preview logs for a better understanding on the thought process behind these changes. Many sources of gold from the Garrison has been reduced or removed. Newly obtained salvage from the Salvage Yard no longer contains equippable items. Salvage obtained from before the patch remains unaffected. A number of items with novel effects have been converted for inclusion in the Toy Box. Orb of Deception now lets the character retain features like armor thatâ€™s worn when transforming. New toy: Soft Foam Sword, sold by Jepetto Joybuzz. The toy mortally wounds (but does not kill) an enemy of trivial difficulty. Major glyphs, along with many minor glyphs, have been converted or removed from the game. The quests â€œScrappinâ€™â€, â€œBattle Pet Roundupâ€, and â€œMastering the Menagerieâ€ now offer reduced rewards, and are now restricted to once per-account, per-day. Master Tamers in Draenor now reward half as many Pet Charms as before. During the Invulnerability Round, Undead pets have -25% damage. The spells Kiss, Sleeping Gas, and Screeching Gears now incur a one round cooldown, and have been damage adjusted to account for this. Base damages has been reduced by about 15% for Thunderbolt, Avalanche, Grave Destruction, Carpnado, Arcane Storm, Psionic Strom, Dreadful Breath, and Cleave. Shell Armor duration lowered from 3 to 2 rounds. Howl damage bonus now only applies to the next strike (was next two full rounds). The cooldown for Thunderbolt is now five rounds. Pandaren Water Spirit's Whirlpool and Geyser abilities are now in the same tier. Gravesâ€™ base stats have been reduced. Grave's Bonestorm and Grave Destruction are now in the same tier. Character nameplates have been reworked and have been upgraded to show class resources. Players may select a larger version of these nameplates from within the Interface Options menu. Enemy nameplates now provide additional information on status effects. Added class resource bars that display directly underneath your character. The character sheet has been trimmed down, though fully verbose stats are still available via the API. Interface options have changed and been further streamlined. Tab targeting logic has been reworked, and should now behave in a more consistent and predictable manner. A buff icon has been added to make it easier to tell when a character has XP gain disabled. The maximum amount of gold that can be held at once has been increased to 9,999,999 gold. Guild bank maximum has also been increased to 9,999,999 gold. Maximum number of characters on a realm has increased to 12. Maximum draw distance has been extended greatly for all world content. 5 additional levels of graphics presets have been added with 3 above the previous â€˜Ultraâ€™ setting. More advanced rendering techniques for fog have been added. Modern techniques for rendering color and other post-effects have been added.